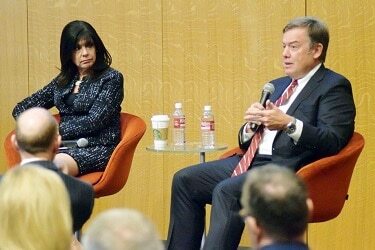 Arizona State University President Michael Crow and Maricopa County Community Colleges Chancellor Maria Harper-Marinick laid out priorities for Arizona’s elected officials and the business community to take an active role in helping Arizona’s institutions for higher education prepare today’s students for success in the fast-approaching world of tomorrow. The educators shared their viewpoints to a packed house at GateWay Community College Washington campus during the Greater Phoenix Chamber of Commerce’s Valley Voices presents the Intersection of Higher Education and the Economy event Jan. 24. Crow, who has transformed ASU into a research powerhouse since taking the helm in 2002, believes firmly that no less than an education revolution is needed in Arizona high schools to prepare students. He identifies flawed educational designs, rigid thinking and old models, such as the idea that some students simply can’t learn math – which he calls “a lie” – as the root problems with Arizona’s education system. But he also says these issues are fixable. In Crow’s view, improvement starts with an acknowledgement that educational attainment is directly correlated to economic success. Harper-Marinick’s piece of the puzzle is ensuring people know that community colleges in general – and Maricopa County Community Colleges specifically – offer education access to all people seeking it. The system provides a great workforce development curriculum and has fruitful partnerships with companies, but that isn’t all it does. It prepares people to attain success on several paths. That may be via career and technical training, or transferring to four-year university such as ASU or even gaining additional training to advance in a career they are already in. Regardless of the path, MCCCD provides opportunities to all.